I had many old audio CDs lying around at home. Though I would want to listen to some of the tracks every now and then I wouldn’t have the CDs with me all the time. I decided t rip all of them as FLAC and save to my hard disk. Going through the options on Ubuntu I chose Asunder. I got flawless quality with the extracted audio. Asunder is lightweight, supports many output formats and is very easy to use. Once you insert an audio CD the tracks will be detected automatically and Asunder will fetch the album information from the internet. It then names the tracks with that information. You can optionally edit the names. 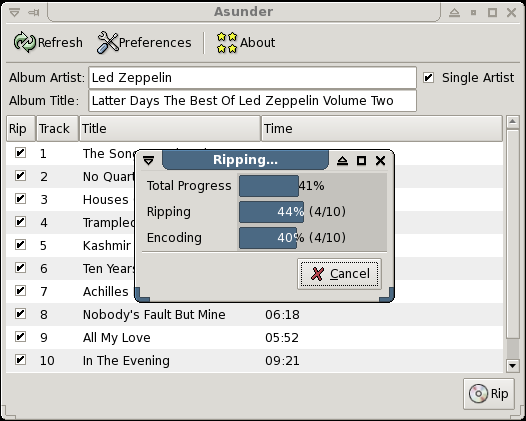 Asunder is a very old tool (the project started Jan 2005) and I might not have covered it but it’s a very useful tool and is still maintained and updated regularly.